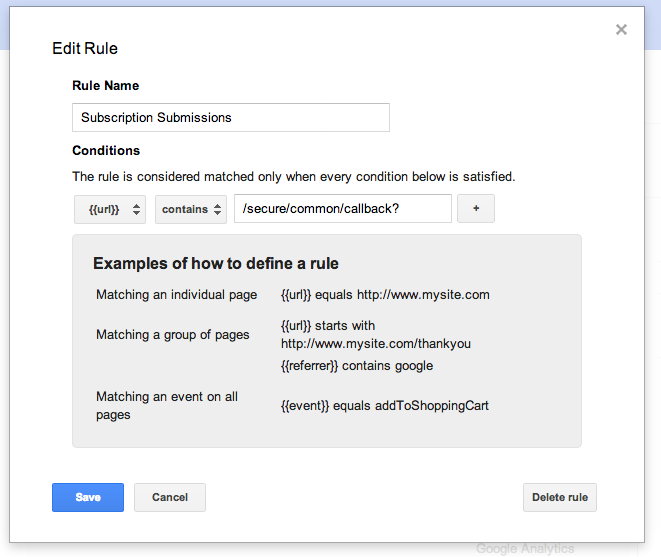 In Google Tag Manager I'd like to fire an event when a particular page is seen. This is for a completed signup page - a conversion. In Google Tag Manager I have my base UA tag fire on all pages. I then created a new UA tag "Subscriptions" to track events: track type events. I then filled in my category, action and label values for the event. However, it's the rules that seem to be tricky. How would I fire the submissions event when this page is visited? Why is the event not firing now - isn't the logic sound? If the URL contains /secure/common/callback? then it should fire, right? You may also want to investigate if you can use regex with your rules to make the above more accurate. Will adding multiple Pageview Tags in Google Tag Manager record multiple page views?